Wayne Rooney may or may not leave Manchester United. But one thing is for sure: Sir Alex Ferguson will have no trouble finding a replacement. Deep down in yesterday’s reports of Rooney’s reticence to stay in Manchester there is the telling comment from Sir Alex. He said that we would be amazed at the number of players who “email my secretary every week” to say they want to play for the club. That’s right, the world’s leading footballers, who earn millions each year, are trying to get a new job by sending an email…! Email is so ubiquitous and we can get so much spam, we often dismiss it as less valuable than other methods of communication. But the chances are the person waiting in the wings for Wayne to go has already emailed Sir Alex. 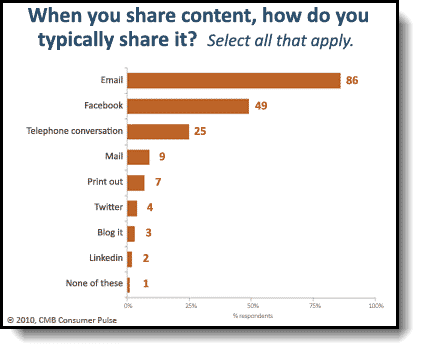 A new study from market research agency Chadwick Martin Bailey shows that email is twice as popular as its nearest rival (Facebook) when it comes to sharing online content. In fact, Twitter, Blogging and LinkedIn combined do not even go anywhere near the amount of sharing of content that is done using the humble telephone. But even that pales into insignificance compared with email. In other words, all the hype over social networking and how brilliant it is for sharing online content – and it is – actually only applies to a tiny minority of people. Almost all of your customers and potential customers share your content using email, rather than any other method. Which begs the question. How much effort do you put into enabling easy email sharing, compared with trying to Tweet about your content or getting those “social share” buttons onto your web pages? If your material cannot be easily shared via email, you are much less likely to get people to pass it on. You may well get people blogging about you, tweeting about you or even mentioning your material on their Facebook wall. But in total, that will still be less than the numbers who could share your material via email. So, what does this imply? It suggests that if you have as “share” button on your web pages, that it must include an email option (check mine above this article…!). It also means for your key content you need better web addresses than most content management systems provide. For example, my article on what is the best blogging software to choose is amongst my most popular. But in order to get people to share it easily via email the address I have created is: grahamjones.co.uk/bestblogging. That is easier to type and is unlikely to “break” across narrow email columns compared with the actual address of the page which is: https://www.grahamjones.co.uk/blog/blogging/what-is-the-best-blogging-software-to-use?.html. All I had to do was create a redirect so that people can more easily share the page. Sometimes, the hype and brouhaha surrounding social media can take our eyes off the ball. Email is still fundamental to business – indeed more sales come from email campaigns than from web pages direct. If you do not focus on email and how people can share your content via email, you are missing a trick – unlike those footballers clamouring to be Rooney’s replacement.